I found this bug while working on an app for our ProductLayer startup. There is a new segue “Present as Popover” which dynamically decides to present a view controller either modally full screen or as popover depending on the available screen width. On iPhone 6+ this shows as popover in landscape orientation and modally in portrait. On iPads it always shows as popover. Filed as rdar://18893122 and on Open Radar. This problem becomes apparent if you want to hide a navigation bar – with a Done button – which is not necessary in a popover since those can be dismissed by tapping outside the bubble. To do that you have to inspect the horizontal size class value of the view controller’s traitCollection. This should always be Regular in landscape and Compact in portrait orientation (on iPhone 6+). The bug is that if you perform this segue with the iPhone 6+ already in landscape then you get an incorrect Compact horizontal size class report. Here is how it should look: The navigation bar gets hidden because the horizontal size class gets correctly reported as Regular. But if you perform the segue with iPhone 6+ in landscape orientation the horizontal size class is reported as Compact and thus we don’t know that we should hide the navigation bar. I am mentioning a nasty workaround for this problem at the end of this article. The segue style “Present as Popover” presents a view controller as modal full-screen or in a popover size permitting. This occurs on iPhone 6+ in landscape orientation and on iPad all the time. If an iPhone 6+ is rotated to landscape and then this segue executed the presented VC gets an incorrect horizontal size class of Compact in the traitCollection. Only when you rotate the device to portrait and back to landscape this gets corrected to Regular. This is a problem for the use case when you want to hide a navigation bar every time the VC is presented as a popover since you can dismiss the popover by tapping outside of it and don’t need a Close button. Launch the provided sample app on iPhone 6+ (sim or device). In Portrait tap on the Segue button. Note that the horizontal size class is Compact. Rotate to landscape. Note that the second VC now gets presented as popover. 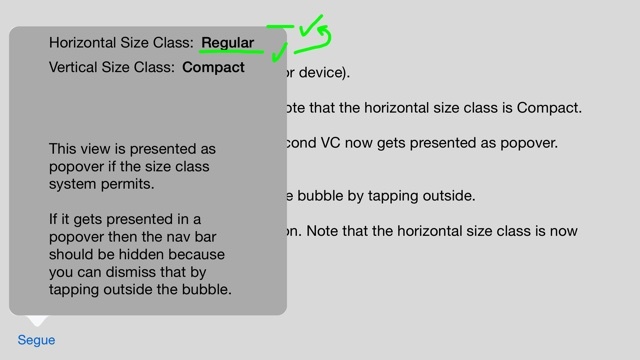 Horizontal size class is now Regular. The nav bar is now hidden, dismiss the bubble by tapping outside. In Landscape, tap on the Segue button. 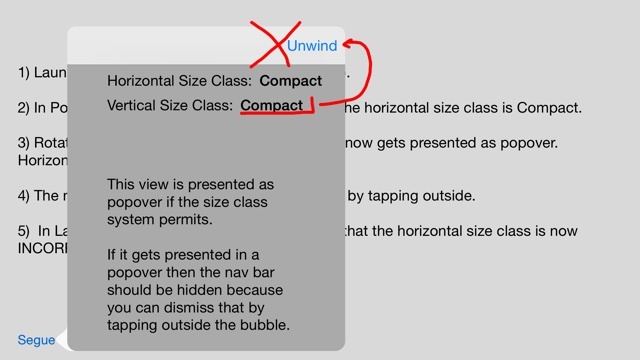 Note that the horizontal size class is now INCORRECTLY Compact.